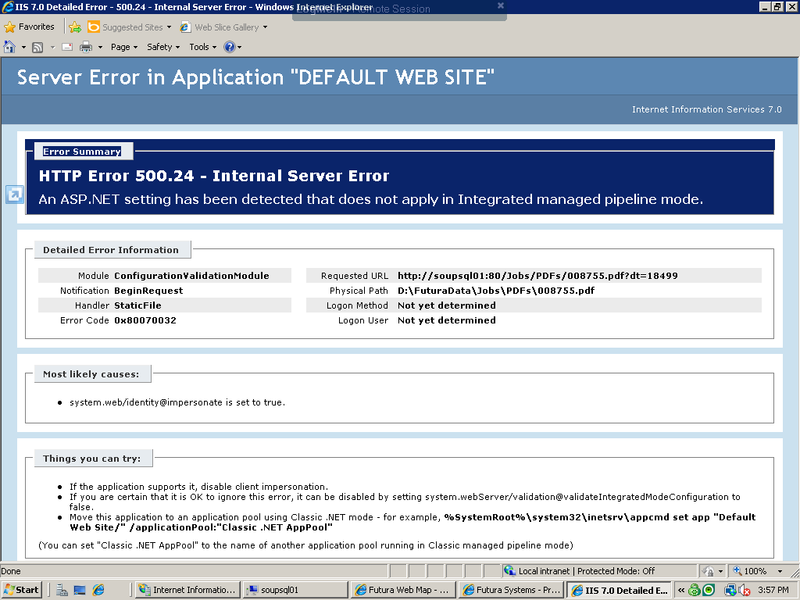 "HTTP Error 55.24 - Internal Server Error An Asp.NET setting has been detected that does not apply in Integrated managed pipeline mode." Your error is specifically to do with 'client impersonation'. I had the same error on one machine but not on another. By comparing settings I worked out the difference. Start IIS Manager. Select the server in the left pane and double click 'Authentication' under the IIS group in the central pane. Select ASP.NET Impersonation and select 'Disable' at the top of the right pane. I changed in my application pool running the site. "Managed Pipline Mode" from integrated to classic. right click on your application pool -> basic settings. how to make ASP.NET 1.1 web app working as child of asp.NET 2.0?